Editor's note: The original version of this article published on Sept. 29, 2016, listed Emory University's ranking as No. 17. On Friday, June 16, 2017, The Wall Street Journal/Times Higher Education College Rankings announced that it had recalculated and republished its rankings. 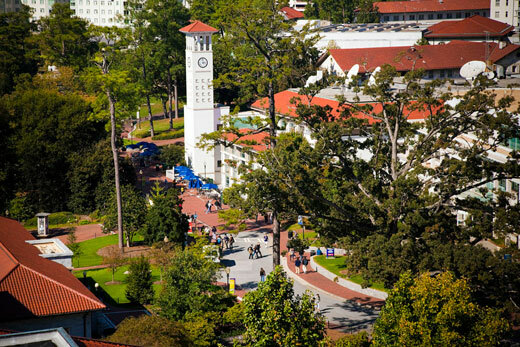 Emory University now ranks 18. This article has been updated to reflect the new ranking. In a new ranking of top colleges and universities in the United States by The Wall Street Journal and Times Higher Education, Emory University ranked 18th out of 500 national public and private universities. Emory was the only Georgia institution included in the top 20 on the inaugural ranking. According to the WSJ/THE, the inaugural ranking “offers a fresh perspective” by evaluating colleges “the way prospective parents and prospective students do.” Specifically, the ranking drew information from 15 factors in four categories: student outcomes, school resources, student engagement and the learning environment (diversity). The ranking also incorporated results from a survey of 100,000 college students on questions about student experience and engagement. The full list of rankings is available here. (Paywall. Requires subscription.) Information on the methodology of the rankings is available here. This recognition builds on Emory’s ranking as 20th among the nation’s top universities in the 2017 Best Colleges guidebook from U.S. News & World Report. Emory also achieved the ranking of 17th in offering “best value” to students and 11th among “best colleges for veterans” in the annual ranking. Emory has been named one of the world’s top research universities (Leiden Ranking), as having one of the best college libraries (Princeton Review), and being a best value among private universities (Kiplinger’s Personal Finance, Princeton Review).